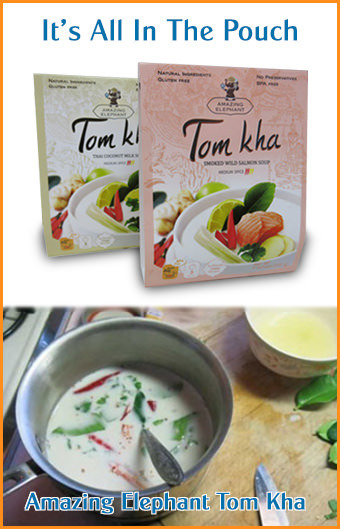 Fresh young Thai coconuts are becoming widely available, along with packaged pure coconut water, both of which can be used to make this wonderful soup. Wash the prawns and shell them without removing the tails. In a medium pot heat coconut water add lemongrass, galangal, fresh chile, shallot, tomatoes and lime leaves. Bring it up to a boil then add mushrooms and shrimps. Wait until its back to a boil then season with fish sauce, prik pao and lime juice. Remove from heat. Serve in a bowl. Garnished with cilantro. Enjoy!